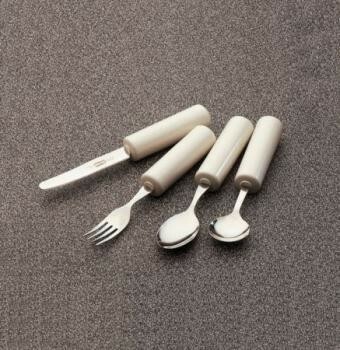 These stainless steel utensils are mounted into a built-up plastic handle for those with weak or restricted grip. Queens Cutlery...These stainless steel utensils are mounted into a built-up plastic handle for those with weak or restricted grip. The handle is cylindrical to assist with gripping. The items are hygienically sealed, easy to clean and are dishwasher safe. Also available as a Set including Knife, Fork, Spoon and Junior Spoon. Length of handle 98mm (35/8"). Diameter of handle 30mm (11/4").